What is better whole blood or components? Why are blood components being used? Why components therapy is better? Today if you go to a modern blood bank and ask for blood, you are very likely to be asked a question –“Which Component?” Gone are the day when the prescribed type of transfusion was whole blood. Today blood from the donor is separated into various different types of cells that it is constituted of and these are called blood components. Each one of us has 60-80 ml blood per kg body weight in our body. Of this 16 ml is maintained as reserve. When a person comes to donate blood, the internationally prescribed standards say that the person may donate 8ml per kg body weight of blood. Since blood bags are available in only 350ml and 450 ml, so a person above the weight of 45 is eligible to donate 350 ml of blood and the person above 55 kg is eligible to donate 450 ml. The question is what is the real difference between donating 350 ml and 450 ml? The answer is simple. It is the difference between saving one and saving up to 3 lives. When you donate 450 ml of blood, the blood is separated into its constituents. One unit is used to prepare red blood cells, platelet concentrate and plasma each of which can be given to three different patients and therefore one unit of blood when separated into component can save 3 lives. Blood is a complex body fluid that has multiple roles to play within our body. Following are some of the important functions of blood. There are specific cells to perform each of these tasks in the blood. When the world did not have the correct understanding on how to prepare blood components, the shortage of any of the blood cells was treated by transfusing whole blood from the donor. This meant that the patient received a host of unwanted cells from someone else just to cater to the shortage of a specific cell. As transfusion medicine evolved, the blood banks learnt how to separate components and now the patient is given only the blood cells that are in shortage in his/her body. An important thing that we must understand is that every time a person is transfused blood, it causes reactions within the donor’s body. 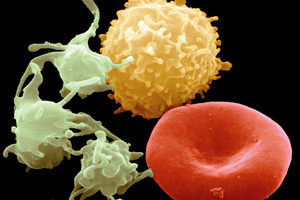 This is because some cells (white blood cells) are very specific to a patient. They are never required to be transfused into the patient but they invariably find their way into the patient’s body in whole blood. These cells may cause an immunological assault on the recipient’s body. When we use blood components, only the required cells are transfused leading to the suppression of un-necessary reactions and problems for the patient. • Improved quality and functional capacity of each component when varied storage conditions and shelf lives were applied. "Availability of blood components shall be ensured through the network of regional centres, satellite centres and other blood centres by creating adequate number of blood component separation units." "Appropriate steps shall be taken to increase the availability of plasma fractions as per the need of the country through expanding the capacity of existing centre and establishing new centres in the country." Component therapy is followed in several other countries satisfying the increasing need of blood to great extent. Very few Blood banks in India have component separation facility. Need of the hour is to adopt this procedure and have 100% component separation. Individual donor to blood bank and the government, it is the effort of all which will bring a change in the prevailing practice of using whole blood to component therapy. A donor who is eligible to donate 450ml of blood should never go for 350ml as it doesn’t make any difference. The donors must insist on donating components of eligible by making sure that the blood bank uses triple bags of blood for collection. Blood bank should encourage eligible donors to donate 450ml of blood. Also they should make sure that such units are separated into components and not used as whole blood. Infrastructure has to be developed and necessary equipments should be upgraded in the blood banks so that not even a single unit is under utilized by not separating into components. Blood banks should take the initiative to educate and explain to doctors the importance and necessity of component therapy. Policies and strict guidelines have to be enforced by the government so those blood banks optimize the available blood units. Packed Cells RBCs or Red Blood Cells carry hemoglobin and thereby help in the transport of oxygen and carbon dioxide to and from the cells respectively is known as Packed Cells. Life - a unit of packed cells has a life of 20-40 days depending on the preserving conditions. Platelets These are the cells responsible for the clotting of blood.